A great dissertation idea for a daring music student. I was so moved the first time I saw Gustav Mahler Conducts the Vienna Philharmonic at the Belvedere in Vienna, Austria. It may not look extraordinary in a pixilated rendering, but its life-size original is breathtaking. The mark of a great painting is its appeal to more senses than just sight. In this painting, not only can you see the wind blowing through everybody’s hair; you feel it. Though non-existent, you become convinced that there’s an actual breeze in the room. This effect blurs the separation between the artwork in front of you and your reality on the other side of it. You are transported from your world into Max Oppenheimer’s fantasy. It thrills and frightens you at the same time. As you analyze the windy effect of this painting, a riddle emerges. The Golden Hall doesn’t have windows, so . . . aha! The epiphany appears. It’s not a literal gust of wind that Oppenheimer paints so eloquently. It’s the unearthly whirlwind of passion that sweeps up each orchestra member—and you, the viewer. It’s rather Pentecostal in nature. The solemnity of said passion is expressed in everybody’s prayer-like closed eyes and bowed heads. One would think this painting has inspired so many orchestra members around the world to grow their hair out–as indeed, many have. What is more becoming of a musician than a swooshy, aerodynamic hairstyle? As a violinist sways with each bow stroke, his hair punctuates each movement. What a brilliant way to get the audience more visually involved in the performance! 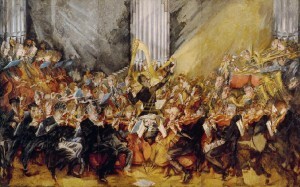 Few paintings capture the dynamic movement of orchestral music as well as this masterpiece does. The wind effect is largely to credit for this. The brush strokes themselves are lively and add to the sense of mobility. The timpani player’s multiple mallet heads clearly illustrate a rapid drum roll. Max’s decision to squish everybody together helps, too. Each player’s individuality becomes irrelevant as they perform, move and breathe as one musical organism. Mahler is the nucleus, the DNA code, the brain and heart, the mastermind. Every line in the painting points directly to him, as he’s placed conveniently at the center of all activity. Despite the sheer amazingness of this aesthetic gem, hardly anyone has heard of it outside of Vienna. I couldn’t find any historical information on the painting online, and a search through print materials was equally hapless. Perhaps I was wise to forgo my original dissertation idea in college. I wanted to explore how artistic portrayals of Gustav Mahler reflected European ideologies of the time. Due to the lack of reliable information, I abandoned the project. I hope one of these days some more daring student will pick up where I left off.